Apple is supposedly planning to unveil a new Apple Watch Series 3 device during its big iPhone event next month, but rumors say it’ll feature the same design as the Series 1 and Series 2 models. That means you can pick up some new Apple Watch bands right now and they’ll still work even if you upgrade! Apple sells tons of bands, but if you ask us they’re all horribly overpriced. In this post, we’ll show you five of the hottest Apple Watch bands you can buy for less than $20 each. Superior Quality: Fullmosa®100% Genuine Full Grain Calf Leather Band – soft and comfortable to the touch. No plastics or cheap fillers. Certified RoHS compliant – free of hazardous and toxic substances. Easy installation: Our newly designed connector with micro-bounce technology makes installing and changing bands simple. 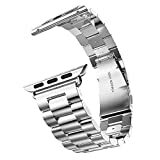 Simply slide the spring loaded metal lugs into your Apple Watch and your watch is ready to wear. The included Assistant Tool makes changing bands easy. Insert the tool to remove the current band and slide in the new one. Appearance: Stainless Steel C-shaped clasp and buckle,and black adapters provide a simple yet elegant look. Our cross stitched collars ensure durability and reliability to keep your ban strap secure and tucked in. The unfixed collars make size adjustment a breeze and allow you to customize the band for a perfect comfortable fit. Notice: Please ensure you choose “Sold by Fullmosa®” for guaranteed quality. We are the ONLY authorized retailer of our brand. If you have any problems with your order please contact us for prompt and courteous service. Our contact information can be found on the every genuine Fullmosa® box. 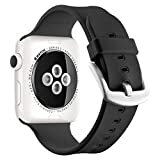 High Quality Material – interchangeable accessory bands for apple watch is made of flexible and durable elastomer material, with surgical-grade stainless steel buckle. Practical Function – our classic replacement bands for apple watch are sweat, rain, splash, water resistant, intended for high intensity workouts and sleep tracking. Classic and Simplicity – transform your new apple watch with our accessories wristbands to create a quintessentially classic look, which conforms to ergonomics. 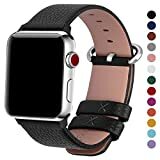 Great wearing experience – Pack of bands for apple watch, more choice to match your daily outfit. Lifetime warranty. 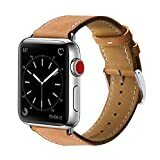 Please search “UMTELE” for other apple watch accessories offered by UMTELE. Timeless Classic Buckle: The buckle is made of solid stainless steel. Secure your Apple Watch with impeccable yet elegant style. Adapters: The adapter is sturdy enough for daily abrasion, we updated a more advanced and durable version, super easy to install and you don,t need to worry about the adapters fall apart easily.And the rose gold Adapter can match the color of the apple watch rose gold aluminum sport.